HPPSC Recruitment 2016 – Apply Online for PGT 632 Post (Post graduate Computer Teacher (Informatics Practices) Class- 3rd, PGT): HPPSC is Himachal Pradesh Public Service Commission govt. organisation which conducts exam for govt. jobs. Candidates, who want to be a teacher in govt. department, may apply for the jobs under HPPSC department. 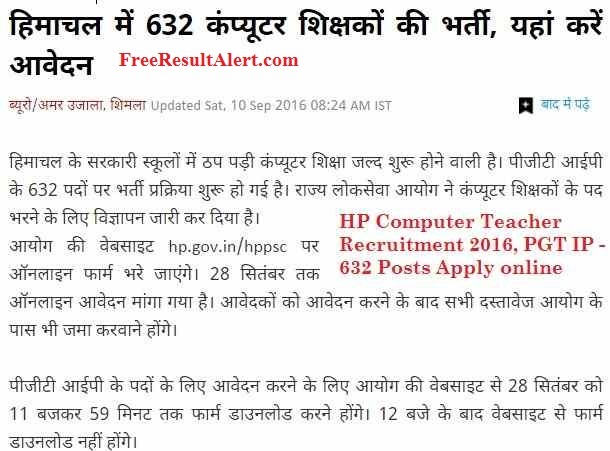 Recently, they have released a notification for recruitment of 632 post graduate teachers for Informatics Practices in HP PSC Vacancy 2016. HPPSC is govt. organisation in Himachal Pradesh whose headquarter is in Shimla and it is formed in 1971. Aspiring candidates must check the official notification on the official portal for post graduate teacher. Official site of HPPSC is www.hppse.hp.gov.in and download notification regarding PGT recruitment. A notification has information about a number of vacant posts, the name of post, job location, pay scale, application form filling date, admit card issue date, eligibility criteria, result declaration date and many other useful guidelines for each candidate for HP PSC Vacancy 2016 online form. All guidelines must be understood by each candidate while applying for PGT post. Age limit- candidate’s age must be 18 years minimum and maximum is 45 years. Educational qualification- candidate must have BE/ BTECH degree in computer science or on information technology. Candidate, who has completed his or her M.Sc or MCA may also apply for this post. Examination Fee: Rs. 400/- for Gen category & Rs. 100/- for SC/ ST/ OBC. No Fee for Ex-Servicemen/ visually impaired candidates of H.P. Click on that link and apply for the post. Enter asked details like name, phone number, email address, educational qualification and other necessary information. Now, after inserting asked information click on submit button to get HP PSC Vacancy online form. If required, take print of this filled application form and start your preparation for written exam.